You know that awful feeling of dread you get once in a great while? The feeling that hits you in the pit of your stomach when you did something wrong and you just know it’s going to eat away at your conscious for the next few years? We’ve all had it happen at one point or another and we’ve heard from many women across America that have had that moment of dread when pulling their mother’s or grandmother’s dress out of the back of a closet that had been long forgotten. Fabric yellowing, stains that set in that weren’t visible when the gown had been tucked away, adornments that lost their battle with gravity… all factors that will often cause our customers to think their gown is beyond the point of repair. Before you lose all hope we’d like to introduce you to our new wedding dress restoration service that has helped many families reclaim their precious memories they had thought were a lost cause. The highly skilled wedding dress restoration team at the Wedding Gown Preservation Company has been trained and certified by the Dry Cleaning and Laundry Institute (www.dlionline.org). Established in 1883, DLI has been the leading trade association for garment care professional for over a century. They’ve established themselves as wedding dress restoration leaders by integrating state-of-the-art, technical laboratories in the heart of their testing and training center. This training facility allows for real world evaluation of the effects of organic and non-organic fabric staining and insight on how to reverse the effect those stains have on various delicate fabrics over a long period of time. This training has provided our team with the insight and industry knowledge needed to become experts in the handling and care of heirloom wedding gowns. 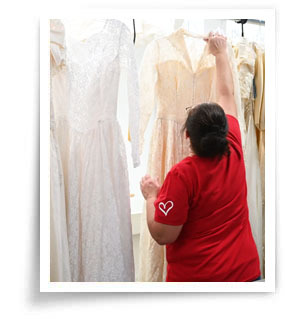 In addition to restoring gowns that have been weathered by the tests of time, the team is also certified to restore gowns that have been weathered by other forces of nature such as flood damage and smoke damage. What Happens During the Wedding Dress Restoration Process? As soon as your gown arrives at the wedding dress preservation facility it goes through an intense fabric analysis to determine which treatment will be most effective at treating everything from staining and yellowing to fabric wear. There some cases in which our award winning SYSTEMK4 wedding dress cleaning process will successfully treat the gown but many times hand cleaning with various fabric-safe and DLI certified agents are necessary. Gowns are often carefully treated multiple times using proprietary formulas that have been passed down by Sara and Joseph Shapiro who founded the company in 1913. After the fabric has been restored the wedding dress will go through a multi-point inspection station to check for fabric pulls, loose adornments and even the full replacement of fabric, lace, beads or buttons. Each dress that is restored goes through a final restoration treatment that helps prevent the dress from yellowing in the feature and in most cases allows the dress to be worn again in the future. All of our restored gowns are given our 100 year anti-yellowing guarantee, the same as our award winning wedding dress preservation service. We took a few moments to interview Kelly Crapser, a member of the wedding dress restoration team, to get insight on the services. Below are a few success stories she shared. How much does the wedding dress restoration service cost? 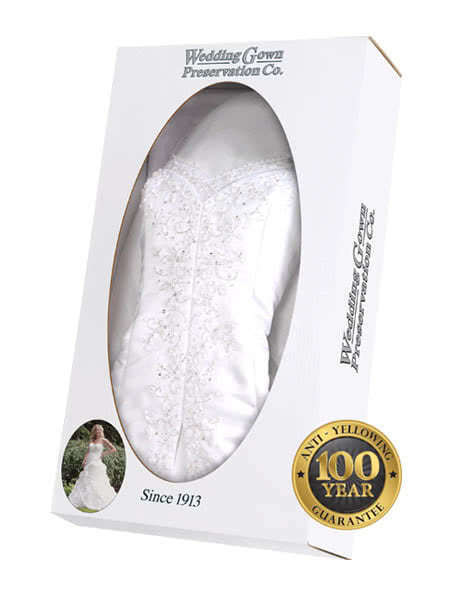 Our Wedding Gown Retoration Kit can be purchased for a low, flat rate of $280.00. This includes 2 way shipping of your gown, insurance for your dress and up to 3 additional items from your wedding day. Personalization of your kit can be chosen during the checkout process for an extra special touch. If the dress is very old and extensive repair is needed, we will contact you if we think additional costs may be needed. How do I know if my dress needs the restoration service or just the regular cleaning and preservation service? If your dress is over 20 years old, then it is generally safe to assume the gown will be in need of restoration. How do I order your restoration service for my gown? Simply visit our Wedding Gown Restoration Kit page, personalize your kit (if desired) and checkout on our website using our easy one-page check out process. Your kit will arrive by mail in 3-5 days. Each gown is individual in its needs. The length of time it takes will vary depending on the condition of the gown but normal restorations will take 5 - 7 weeks. Rush processing can be added to your order which shortens the processing time to several weeks. Does the team stay up to date on the latest restoration technology and techniques? Yes, the staff is retrained on-site by leading fabric consultants twice a year. These consultants specialize in the restoration and care of museum piece garments. Do You Have Additional Question About Restoring Your Gown? We cover most of the questions you may have in our preservation FAQ but you are more than welcome to call our office at 877-872-5538 M-F 9am- 5pm EST and we'll be happy to assist.